Delhi, September 25th, 2014: ŠKODA AUTO India introduces the new Rapid with new 7 speed DSG automatic transmission and a powerful 1.5 litre TDI diesel engine. With superior build quality and exclusive features tailor made for the Indian market, the Rapid model range will start at Rs. 7.2 lakhs (Petrol) ex showroom Delhi. The Rapid is ideal for the Indian roads with an attractive design, ample space, excellent safety equipment and modern proven technology. 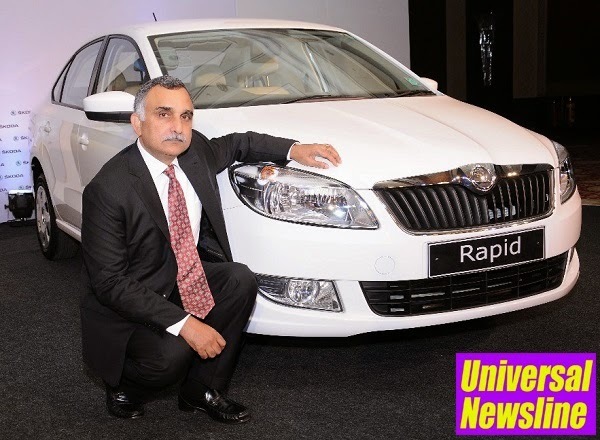 The new Rapid will be available across all authorized showrooms in the country. ŠKODA’s unique automatic dual-clutch DSG (Direct Shift Gearbox) transmission is composed of two transmission structures. This dual-clutch gearbox offers the function of two manual gearboxes in one; by contrast, it uses two dry clutches, but has no clutch pedal. Both clutches are actuated by the automated control system depending on the selected gear. Thanks to its very rapid shifting it enables you to achieve excellent acceleration while operating in the optimum mode and also being extremely fuel efficient. Customers can now choose from six exciting colour options – Brilliant Silver, Candy White, Cappuccino Beige, Deep Black Pearl, Flash Red and the new Toffee Brown colour (the Toffee Brown colour is expected to be available in November). The ŠKODA Rapid will also be available with a new sporty exterior design with the set of black elements: headlamps, fog lamps, grille with logo-lip, multi-spoke alloys and external mirrors. Numerous electronic safety systems enhance the ŠKODA Rapid’s safety. The Rapid comes with ABS (Anti-lock Braking System), EBC (Engine Braking Control), dual rate brake assist, height adjustable head restraints at front and rear, driver and front passenger airbags. Additionally, the fuel supply cuts off in the event of an accident. Visibility is further enhanced with its projector head lamps (manual levelling). The Rapid comes with an electronic theft deterrence module that includes engine immobiliser with floating code system and security code for audio player. Along with comfort opening and closing of all windows, the unique anti-pinch system ensures your family is well protected. The climatronic air conditioning system ensures that the customer can set the optimum temperature within the cabin. The new Rapid has adjustable dual rear air conditioning vents on rear centre console for better air distribution. The new Rapid also flaunts a comprehensive entertainment suite that includes a 2-DIN ŠKODA audio player, large format display, front and rear speakers, audio and phone controls on steering wheel, USB and Auxiliary audio input for portable media players as well as the SD/MMC data card reader. The Radio can be remotely controlled from the phone App “Škoda Remote” available for iOS as well as for Android phones. The Rapid offers new generation rear parking sensors as a driver aid. For the first time, it will also give drivers the option of the cruise control that assures the optimal driving comfort along with the best fuel efficiency. Online auto repair manuals Skoda is available at manuals.co website and the instructions are easy to get by the users.